12 “I have yet many things to tell you, but you can’t bear them now. for he will not speak from himself; but whatever he hears, he will speak. I had an experience a few years ago where I had to speak at two churches in the same Sunday morning. They were a 15 minute drive apart and I only had 15 minutes to get from one church to the other. Both churches were in the country so my car's GPS didn't work. I had no idea how to get to the second church from the first church's location. Needless to say, I felt a little stressed about how I was going to get there without instructions. One of the leaders of the first church saw my discomfort and volunteered to drive her car in front of mine so that she could lead me to the second church. I was so relieved that I didn't have to try and negotiate the varying speed limits, tricky turns, etc. all by myself. It was a beautiful autumn morning and I can remember just enjoying the drive as we drove by corn fields being warmed by the bright sun. In the midst of this experience, I felt the Lord speak to my heart and say... "This is what it feels like to be led". Immediately I was aware of what the Lord was saying to me. Today's promise says that we don't have to chart our own course in life. 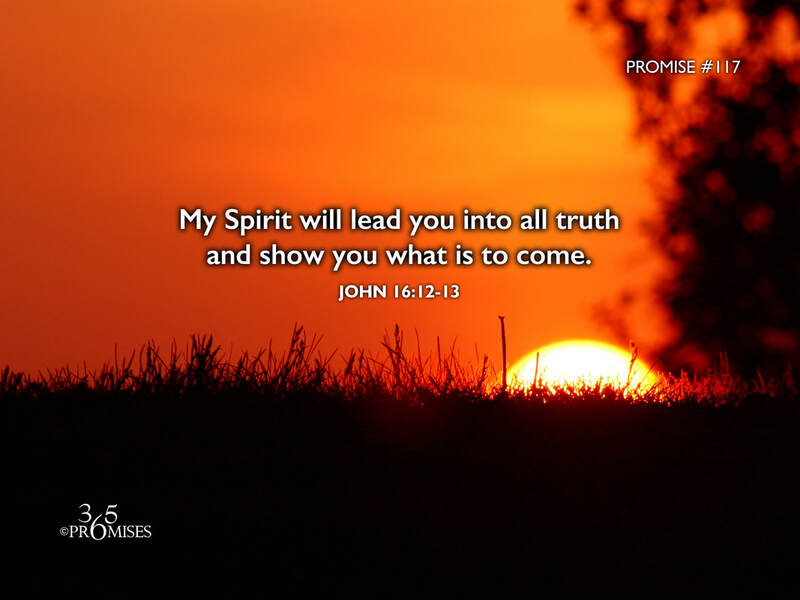 Jesus promised that the Holy Spirit will lead us and guide us in all truth and all we have to do is simply follow Him. Hallelujah! That is wonderful news!